Don’t go unprotected! Electrical accessories can send voltage spikes through your system, damaging everything from light bulbs to computers. The safe way to add electrical accessories is with CirKit Boss, the first circuit isolating auxiliary fuse blocks that provide both constant and ignition hot circuits. No more tapping into an existing wire or into a spare circuit at the fuse block. 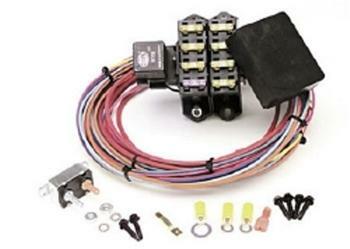 Using these add-on, relay activated fuse blocks is the safe way. Only a small activation wire from any ignition source is needed to turn on the relay that turns on the fuse block. All CirKit Boss models are made using TXL cross link polyethylene wire rated to 125 0C (275F) degrees. All harness wires are 48” long and factory machine terminated. CirKit Boss includes an in-line circuit breaker, relay, mounting hardware, & terminals. Protects your OEM warranty. Easy to install. Safely adds ignition hot and constant hot circuits.